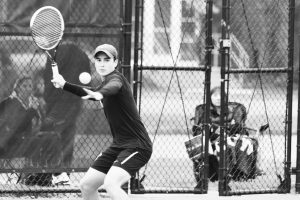 DePauw University’s men’s tennis team hosted the DePauw Invitational over the weekend. In addition to the host, the University of Indianapolis (UIndy), Saint Joseph’s College, and William Woods University were the teams in attendance. “This year’s competition was by far the best in my four years here,” said senior Pat Farrell. Singles play was split into A, B, C, and D brackets while doubles play had only three brackets. The singles A bracket featured seniors Dan Rodefeld and Farrell. Farrell lost a very close opening match 7-6 (7-5), 6-4 and his second match 6-3, 0-6, 1-0 (10-4). However, Farrell would end his day with a win defeating Llya Kalabuukhau of Saint Joseph’s 7-5, 6-1 in the seventh place match. Rodefeld found success early advancing to the semifinals with a win over Kalabuukhau 6-3, 6-4. In the semifinal match, Rodefeld would taste defeat losing to Nils Hoffacker of UIndy 6-4, 6-4. Despite the defeat, Rodefeld went on to win the third place match agains Johnnie Carmichael of William Woods. The B bracket saw sophomore Matt Quammen and senior Matt Santen in action. Despite losing his opening match of play, Quammen would go on to win fifth place, defeating David Barbieri of William Woods 6-3, 6-2. Santen fought his way to the third place match where he won by default. The C bracket featured senior Nate Wallace, and sophomores Greg Frauenheim and Petar Barcot. Both Frauenheim and Wallace would advance to the semifinals where they would end up facing each other. Frauenheim defeated Wallace 6-3, 6-2. Frauenheim would go on to win the C bracket when his opponent retired after the first set. In the D bracket senior John Daseke and sophomores Alex Pintilie, Alex Bertolini, and Andrew Fox all picked up wins. In doubles A play, Rodefeld and Farrell would lose their semifinal match 8-2 and only took home third place after defeating Nicolas Palacios and Vicente Herrera 8-4. In B play, seniors Harold Martin and Wallace would take 2nd place after losing 8-1 in the finals. C play saw a another Tiger vs. Tiger final. Daseke and Barcot beat Santen and Quammen 8-5. The Tigers have a matcha at Marian University on Sept. 20 and then begin their ITA Regional Championships at Kalamazoo College Sept. 24. The Tigers will then take a break for the rest of fall and winter and restart play in February for the spring season.